I'm delighted and honored that my photograph, "Pure world," is included in the exhibition Curiouser and Curiouser: Photographic Dreams and Fictions at PhotoPlace Gallery, 3 Park Street, Middlebury, VT, 802-989-2359. You can see from the online preview how beautiful and full of mysterious images the exhibit is going to be, and also view additional photos in its online annex. The exhibition runs from October 8 through November 1, 2013, with an opening reception on Friday, October 11 from 5:30-7:00 p.m. The juror was independent publisher, curator, educator, and photographer Blue Mitchell, who is Founding Editor of Diffusion Magazine. 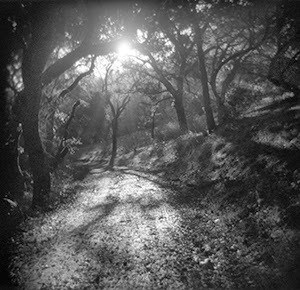 I'm honored and excited that my photograph, "When you least expect it," will be included in the online portion of the Holga Out of the Box exhibition at TCC Photo Gallery, 207 N. Center Street, Longview, TX. The exhibit runs from October 3 through November 22, 2013. "Ansel Adams was my first and only formal photography teacher, with the hardly surprising result that for the next few years, large-format B&W landscapes became my definition of fine art photography. It took me years to realize that I didn't actually lead a fine-grained life ... I still love the images I made in those early years, but where Ansel's world was monumental and sharply defined, my world has become increasingly quirky - and decidedly fuzzy around the edges. 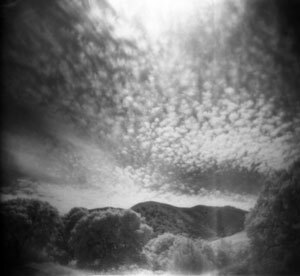 My ability to capture that world took a great leap forward in 1990 when I discovered the Holga ... Simply put, it sees the world the way I do." (Light Leaks Magazine, issue 18, p. 27). You can view the online portion, and preview the gallery show, here. It includes stunning work by some of my favorite artists who use the Holga.